A Swedish diplomat who led a rescue operation to save nearly 100,000 Jews in Nazi-occupied Hungary has been recognised as the first honorary Australian citizen. Raoul Wallenberg saved the lives of tens of thousands of Jews during the Holocaust in 1944 by issuing protective passports and providing shelter in diplomatic buildings. Mr Wallenberg had already been honoured in Australia through parks and monuments but Governor-General Quentin Bryce said she was proud the country was now going “one step further”. “I cannot think of a more appropriate and significant figure to welcome to our Australian family,” she told a ceremony in Canberra on Monday. The diplomat was arrested by Soviet troops in January 1945 at the age of 34. The exact date and circumstances of his death are not known. Frank Vajda, a professor of neurology at Melbourne University, was saved by Mr Wallenberg’s actions as a nine-year old boy in Hungary. He has since campaigned for honorary citizenship for Mr Wallenberg for decades. Professor Vajda and his mother were lined up in front of a machine gun for not wearing the yellow Star of David in 1944. Mr Wallenberg persuaded members of the pro-Nazi Arrow Cross Party to release their group. Monday’s ceremony at Government House was also attended by George Farkas, the son of John Farkas – a resistance fighter who was the last known person to see Mr Wallenberg alive. “I think it’s a recognition that some people can do unbelievable good in the face of reprehensible evil,” he said of the award. Mr Farkas said there had been sightings of the diplomat up into the 1980s in Russian prisons and psychiatric hospitals. “Can you imagine what Wallenberg must have thought … that the world had forgotten him?” he said. Mr Wallenberg has already been recognised as an honorary citizen of the United States of America, Israel, Hungary and Canada. Prime Minister Julia Gillard announced that Mr Wallenberg would be similarly honoured by Australia last week, in recognition of his “tireless devotion to human life during the Holocaust”. The move was supported by the Coalition. On Monday, Opposition Leader Tony Abbott said it would have been “so easy to look the other way”. “Of all the examples of resistance to Nazi tyranny, Raoul Wallenberg’s is perhaps the most flagrant,” he said. A spokeswoman for Ms Gillard said that the Prime Minister gave ‘‘long and careful consideration’’ to the most appropriate form of recognition for Mr Wallenberg, including consulting with the ministers for Immigration and Foreign Affairs, before making a recommendation to the Governor-General. As the first honorary Australian, Mr Wallenberg’s memory gains the ‘‘unique recognition associated with that status,’’ but the award does not give any status or entitlements to Mr Wallenberg’s descendants, the spokeswoman said. 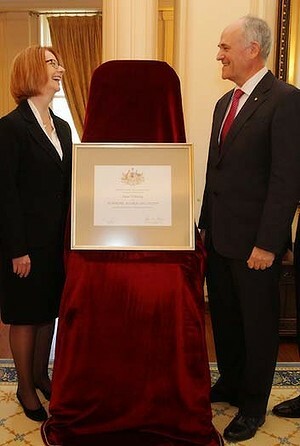 The Gillard government is not currently contemplating honorary citizenship for any other individuals.